If the time has come for you to go through with that long awaited office relocation, then you and your staff have plenty to do, and quite a few things to take care of. Full scale office relocations are complex projects which usually end up costing more time, money and effort than initially anticipated. This is not due to lack of managerial skills or dedication on behalf of owner or staff, but due to the technical and specific nature of office relocations. Even sufficiently planned office removals, scheduled for a suitable time, can catch owners or managers off guard, as there are just too many issues and considerations to account for. Not to mention the fact that everything must be completed on time, and within budget, as failing to meet certain deadlines or budget constraints can leave your business worse for wear, financially. If you want to make your office removal less of an ordeal and reduce the toll of the whole project on yourself and your staff, then perhaps we at Harlesden Office Removals can assist you with a professional grade office removal service options, which will get the job done right, and leave you with money to spare. 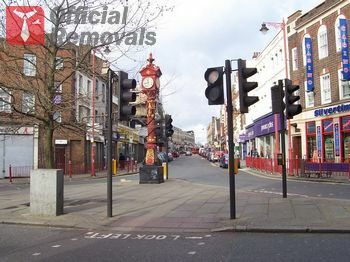 The company specialises in full scale or partial office relocations, and provides a number of additional removal services, aimed mainly at commercial customers in and around the Harlesden area. Being a locally based and owned service provider puts us closer to local businesses and establishments, which means we know exactly what customer expect of a good quality office removal service that is worth their time and money. Our aim is to provide customers with fully comprehensive, end to end servicing, as having each stage of the relocation process, organised and carried out professionally, is the only way to ensure timely completion and no excess costs or hassles. Harlesden Office Removals appreciates the importance of working with dedicated, professional movers who have the required practical skills and technical expertise, as this is the only certain way to avoid damage or misplacement of office items and equipment during the relocation process.